The Glasgow Prestwick Airport has secured a government investment of £80 million ($104.8 million) to develop as a spaceport. improvements to the area’s transportation infrastructure to accommodate the new development. The funding is part of a larger Ayreshire Growth Deal under a cost-sharing arrangement. The UK government will invest £32 million ($41.9 million) in the airport, the Scottish government will contribute £30 million ($39.3 million), and the South Ayrshire Council will spend £18 million ($23.6 million). “The Aerospace and Space sector employs over 4,000 people in Ayrshire, more than 50% of the sector’s total workforce in Scotland,” according to the Heads of Terms agreement. “With Growth Deal investment it has the opportunity to double this number over ten years. “It is home to a cluster of global companies including BAE Systems, GE Aviation, Spirit, UTC and Woodward. Both Governments and local partners recognise the current importance and development potential of this sector to the region, Scotland and the UK,” the document added. “The ASIC will provide “a central hub for the growing aerospace cluster, as well as key facilities and services to encourage growth, supporting aerospace and space businesses in Scotland and the UK. The facilities will focus on business development, skills development and training needs of the Aerospace and Space sector in partnership with local and national higher and further education establishments, including University of Glasgow, University of Strathclyde, University of the West of Scotland and Ayrshire College,” the document said. “The Development of Commercial Space project has been formulated to address market failure in the provision of commercial premises at Prestwick, a problem reflected across Scotland. The project is vital in order to capture the economic growth opportunity from the Space and Aerospace sectors,” the agreement stated. Another government funded Field of Dreams! 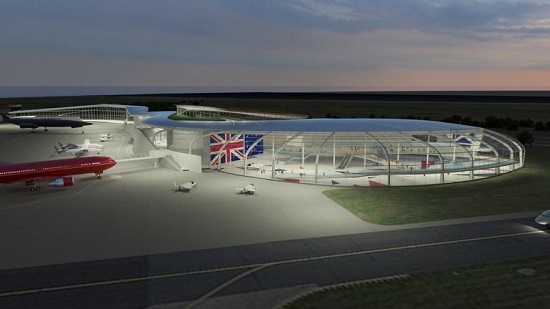 Is this being built for the benefit of Virgin Galactic, or are there other likely tenants? Despite the cynicism, I must admit I like the idea of a potential future of regular flights to space for tourists and cargo beyond the current satellite genres. I suspect that, like a lot of public infrastructure, it’s being built mostly for the benefit of politically connected local contractors. Spaceports seem to be rising in popularity as something the officials of mid-size cities have decided to latch onto in order to seem more impressive to their peers. Two or three decades back every such town had to have a spandy new convention center. My eight square mile city of residence has its own bus line believe it or not. Now it’s spaceports that are fashionable. Local government is a milieu that is as susceptible to fads as any other. This particular fad, I suspect, has some distance to run yet. There are, after all, no suborbital tourist flights yet being offered anywhere and smallsat rocket launches are barely more established. Once both start to happen in significant numbers, the extant spaceports will be clamoring to be included and yet more spaceports will spring up. The ascending slope of this fad may have as much as another decade to run. Or maybe there will actually be enough demand to make most of these notional spaceports useful. Wouldn’t that be something.